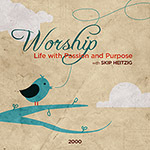 Worship: Life with Passion and Purpose is a comprehensive look at the role of worship in the lives of believers. In the series, Pastor Skip Heitzig looks at examples of several people in the Bible who understood what it is to worship God. These people realized that worship is not just singing, but a lifestyle. God created us to worship Him and certain qualities will be evident in your life if you are a true worshiper. As we study the lives of worshipers in Scripture, we can understand what true worship is--and use it as a template to follow in our own lives.